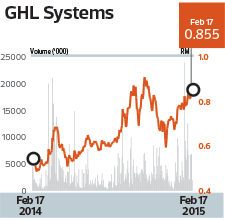 BANK NEGARA MALAYSIA’S renewed push to speed up the country’s transition to a cashless society has helped open doors for GHL Systems Bhd (fundamental: 1.40; valuation: 0.30) in expanding its transaction payment acquisition (TPA) business. The central bank is targeting debit card transactions to multiply from 90 million per year now to a billion annually by 2020 while the number of point-of-sale terminals is expected to balloon to 800,000 by 2020 from 280,000 now. To encourage the use of debit cards, Bank Negara has imposed a ceiling on interchange fees payable by the acquiring banks to the banks that issue the payment cards. For domestic debit card payments, the fees shall not exceed 0.15% of the transaction value or 50 sen plus 0.01% of the transaction value, whichever is lower. “It was music to our ears when Bank Negara announced this framework ... it will open doors for us,” says GHL CEO Lorenz Raj. TPA is intended to be GHL’s growth engine going forward. This business segment involves acquiring merchants, for example shops or dining outlets that accept card payments by deploying GHL’s payment system. As the third-party acquirer, GHL will talk to the commercial banks to become the merchants’ banks that authorise the transactions. In the process, it will earn a fraction of the transaction fee that the merchants are charged for payments received. He notes that it would be difficult for the commercial banks to meet Bank Negara’s targets unless the small businesses also accept debit card payments. 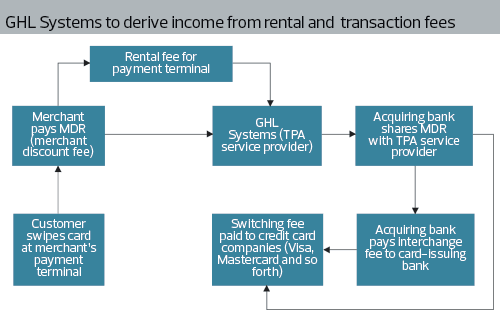 In fact, most of the banks are already GHL’s clients but this is mostly for credit-card operations. The group plans to acquire 4,000 small merchants this year, which would grow its recurring income base substantially. “If we can handle just 2,000 merchants a month that would already make us the largest merchant acquirer in Asean. We are making inroads into Thailand and the Philippines as well, both of which are underserved markets,” says Lorenz. The group looks well positioned to ride this broad market reform, which could translate into steady earnings growth if it gains traction. Recently, the group entered into an agreement with Global Payments Card Processing Malaysia Sdn Bhd to act as a payment facilitator and payment service provider using the TPA model. Lorenz sees the partnership with Global Payments as a milestone for GHL. Under the agreement, it will, among others, acquire eligible new merchants by providing sales, marketing and onboarding services on behalf of Global Payments. Additionally, GHL will facilitate transactions and the settlement of funds between Global Payments and the new merchants. 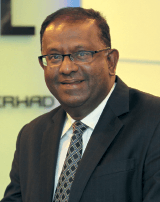 “Following Global Payments, which is partnering HSBC Bank, we are in discussions with another significant Malaysian bank and we are hopeful of a positive outcome soon,” says Lorenz. An agreement with micro-lender Amanah Ikhtiar Malaysia Sdn Bhd (AIM) two weeks ago entails the deployment of 8,000 payment terminals to facilitate e-payments by the company’s 350,000 borrowers. The TPA business appears to be promising and will enable GHL to have a recurring income base from fees earned from each transaction. Nonetheless, it will also be exposed to credit risks. “Yes, there is credit risk, so we need to have a risk management system to monitor all the merchants that have signed up with us,” says Lorenz. Meanwhile, revenue generated from debit card transactions is minimal, says Lorenz. Earnings from the TPA division are largely contributed by e-pay Asia Ltd (EPY), which GHL has bought over from its controlling shareholder, Simon Loh, who holds a 36% stake in GHL. EPY provides payment solutions for uploading prepaid phones, utility bill payments and so forth. For the nine months ended Sept 30, GHL posted a net profit of RM6.41 million, up 14% from RM5.61 million in the previous corresponding period. Revenue grew to RM115.8 million from RM50.97 million. In a Feb 12 note, CIMB Research says this could translate into an additional net profit of up to RM2.7 million in FY2015 and FY2016. It projects a revenue of RM216 million and net profit of RM16.06 million for GHL in FY2015. The research house has pegged a fair value of RM1.10 to the stock, which closed at 85.5 sen last Tuesday, giving it a market capitalisation of RM547.6 million. The target price is based on a forward earnings multiple of 23.8 times as well as GHL’s strong expected compound annual growth rate of 76% in its earnings per share between FY2013 and FY2016. The stock has been climbing steadily since late December, rising from a low of 59.5 sen on Dec 16 to 85.5 sen last Tuesday. This article first appeared in The Edge Malaysia Weekly, on February 23 - 29, 2015.